Demi was featured in an article in the Palm Beach Post. 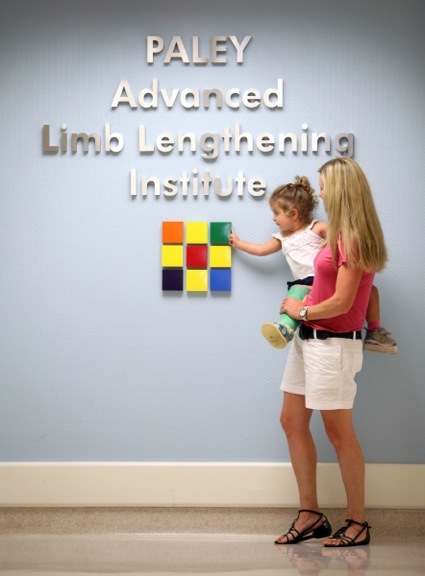 We discovered our daughter Demi had a problem with her right leg 18 weeks into the pregnancy during a routine scan. After multiple ongoing scans doctors were unable to provide a definitive diagnosis, we were told it could be anything from a single missing bone to brittle bone disease. When our daughter was born in April 2010 doctors finally diagnosed she had Fibular Hemimelia. 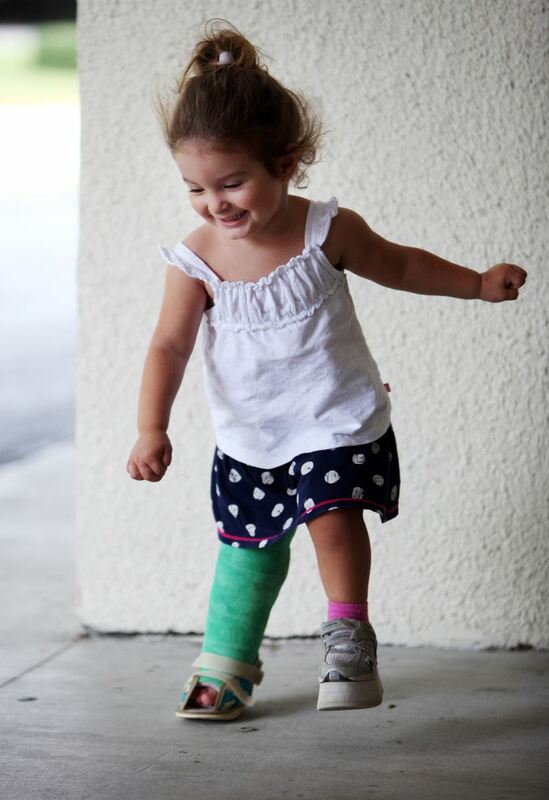 We started our search for an orthopaedic surgeon and took Demi to a number of surgeons across Australia and a surgeon in Singapore looking for treatment. The surgeons we visited all recommended amputation as the best outcome. One surgeon even said “You should go away and enjoy your daughter and come back in 18 months and be prepared for an amputation, she would need at least 12-18 operations to try anything on her leg”. 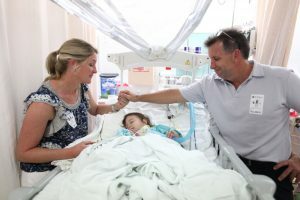 To us amputation was an absolute last resort, surely there was an alternative and with the potential for future advances in the medical field it seemed crazy to not try and save our daughter's leg. We continued to research options for treatment and found Dr Paley, who was in Florida on the other side of the world from us 14,000 miles away! 081011 (Richard Graulich/The Palm Beach Post) West Palm Beach - Demi Reilly, 15 mos old, and her parents Simon and Sandy, the day before her surgery to fix her leg at St. Mary's Medical Center Wednesday. Our dialogue with Dr Paley started in late 2010 via email, sending pictures of Demi’s leg and foot, information and x-rays. From the outset Dr Paley answered every email and every question we could ask of him in our limited knowledge of this condition. He always provided not only the answers but also followed up more information from previous treatments on the specific type of FH that Demi had and how he had made improvements over the years. This put my wife and I at ease with Dr Paley and we were beginning to see light at the end of the tunnel. Dr Paley was always positive about the treatment and the outcomes, this was a far cry from the surgeons we had seen and the outlook we were being given by surgeons in Australia. To travel so far and for such an extensive length of time was still quite daunting and we had no reference point as no other Australians had ever been to Dr Paley. We were putting a lot of trust and our daughter’s future in the hands of a guy we had never met! We established a time frame for travel to the USA and booked an operation date for August 2011. We travelled 30 hours door to door to see Dr Paley from Palm Beach Australia to Palm Beach Florida. Our first consultation with Dr Paley included 16 other surgeons from around the world visiting for a tutorial. This was actually very beneficial for us as Dr Paley explained to everyone in the room how he used to perform the operation Demi was going to have, the new and improved techniques he was using now and why he was using them and laid it all out from A-Z. After this I always remember Dr Paley turning to my wife and myself and saying, “Do you have any questions”. I replied “when you can start!” From that moment on we knew without doubt our daughter was in the best hands possible. The operation took almost eight hours and it was probably the longest day we have ever had but we were kept updated at all times by either Dr Paley, his staff or assistant surgeons coming and speaking to us about the progress at all times during the day. The level of care and consideration from everyone at the Paley Institute and hospital was phenomenal, way beyond what we would have ever anticipated and this personal touch made the world of difference to us. We stayed in Florida for three months during Demi’s treatment. During this time Demi received specialised physiotherapy everyday and we had access to an amazing team of specialists at the Institute that took care of Demi’s needs impeccably. Her leg was lengthened by five centimetres and she had the super-ankle procedure. Dr Paley would make his visits when scheduled, he was very focused on his job at all times, and we always felt confident of his care for Demi. He was always one step ahead of Demi’s treatment. He would tell us things and things would happen exactly how he told us. Dr Paley’s answers were straight up front and always with a reason behind his planning. We knew exactly where we stood at all times with our daughter’s treatment and nothing was ever too much of a problem to ask of Dr Paley and the staff at the Paley Institute. Even when we were back in Australia for six months while Demi still had the fixator on, Dr Paley and his staff were always accessible to help us with any issues or concerns and responded quickly. Their service to patients is simply above and beyond. Our daughter is now five years old and living life the same as any other five year old. She even recently completed a one-kilometre cross country race at her school, something her physio told us would not have been possible if she had a prosthesis. We will return to Dr Paley for another leg lengthening in a couple of years but meanwhile Demi is thriving and we are thrilled that we found Dr Paley and saved her leg. Dr Paley and his team are second to none in their experience and pioneering treatment for limb conditions and the very human and compassionate way in which they treat patients and their families. Since our visit we have helped a number of other Australian families make the journey for treatment with Dr Paley and all of them have had great results from treatment and glowing praise for Dr Paley and his team. We cannot recommend Dr Paley, The Paley Institute staff and St Marys Hospital highly enough!